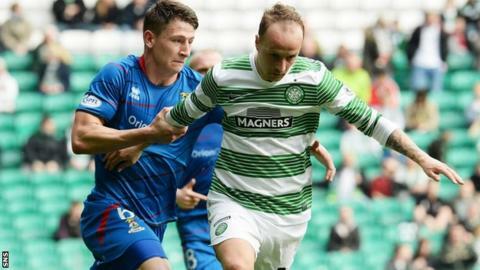 Inverness Caledonian Thistle manager John Hughes admitted his side had been dismantled at Celtic. The Highlanders went down 6-0 to the Scottish Premiership champions, with Caley Thistle's Aaron Doran having a penalty saved at 3-0 down. "No matter what's happening in the game, you have to stand up and still be resolute," Hughes told BBC Scotland. "You cannot feel sorry for yourself and I felt after the third goal, we felt a little bit sorry for ourselves." Anthony Stokes' hat-trick put Celtic in control before Leigh Griffiths, Efe Ambrose and Teemu Pukki added to the home side's tally. "Celtic were awfully good and every time they went forward, they looked like they were going to score," Hughes lamented. "Two or three of the goals were self-inflicted, getting done on the counter attack. We're a better team than that. "We came here with a game plan to try and keep in the game and it was really disappointing. "I don't mind anyone scoring a great goal against us, a great team goal as Celtic did as the game went on, but the first goal was from a set piece. We had put so much into the game and that was on 30 minutes. "In the second half, we missed a penalty and you say, 'it's not going to be our day'." Hughes urged his players to learn from their heavy defeat. "They [Celtic] are the best in Scotland, they're miles in front of anybody," added the Inverness boss. "You have to aspire to be as good as that. What we're saying is, 'let's go and try and be as good as we can be'. "We'll never overtake Celtic but we might give the rest of them a good go."